On Tuesday morning we received an irresistible offer. But we had to make it to Columbus, Ohio. It was now 10AM and we were four hours away in Lexington, Kentucky. The offer expired at 6:45PM, so the clock was ticking. We scoured our ride offers, called any leads, but it was all dead ends. Fiddy even got a hair cut, but this didn’t help anything. We knew time was running short, so we had to act quickly. Lloyd let us take the Geo a little north of the city to the interstate 75 junction. We parked it there, packed our bags and put out the thumbs. The time was now 11AM. 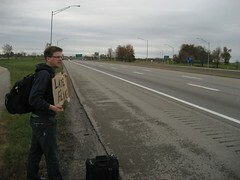 With pizza box signs we stood on the side of I-75 for almost two hours before our ride revealed itself. Charles, a camera shy Cincinnati resident finally stopped and helped us out. Charles says he likes to help out people, and will always do what he can. 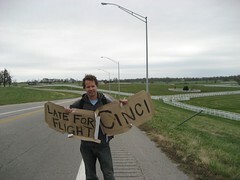 He dropped us off in Covington, just south of Cincinnati to wait for our next ride. 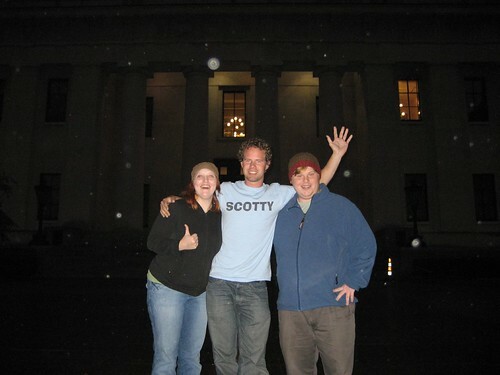 Greg called earlier in the day and said that he lives in Cincinnati, and could take us from there to Columbus. We were greeted by two friendly, smiling faces peering out of a Volvo in a parking lot in south Cincinnati. The time was now about 3PM, it looked like we would make it on time. Greg and his girlfriend Tori are both Cincinnati residents, going to school and slangin' pastry. The time was nearing 6PM when we left the capitol building, we needed to step on it, but Columbus traffic had other thoughts. Greg showed off his best taxi driving skills, weaving in and out of traffic, ducking into back streets and through short cuts. It paid off and we arrived at the airport with 20 minutes to spare. After a quick goodbye we walked inside, checked in and got on our flight. Dang it! We were hoping to help you guys out and missed you completely! Grrrrrrrrr Sorry your trip to Columbus was anticlimactic. Stop by again when you can stay for awhile.